Is Bitcoin a misguided information technology tool here to create more problems than it solves? I read this article and found it very interesting, thought it might be something for you. The article is called Beyond Bitcoin and is located at http://evonomics.com/beyond-bitcoin/. A growing number of economists are concerned about the widening rift between the actual productive economy and its financial counterpart, noting that new banking tools create value that translates into money but not also into real production value. The utilisation of money as a credit tool is criticised by many, who claim that in a world of finite resources, unlimited financial expansion is an illusion (Greco, 2009). Although money is a legacy of the first phase of industrial capitalism, it must now be attuned to the information age and its characteristics; a key critique for the discernment regarding the future form of currencies. According to Carlota Perez (2009), we are now experiencing the turning point of the information technologies revolution. Already, we have gone through its installation period where economies experimented with – and finance capitalists invested in – new technologies, albeit only in the short term. The NASDAQ bubble of 2000 and the financial crisis of 2007 are, according to Perez, consequences of such speculative behaviours (Perez, 2009). This calls for a period that will better utilise the dynamics of new technologies, creating synergies throughout society: a structural change that will offer new solutions. It seems logical, then, that digital currencies are emerging to present an alternative to this dire situation. Modern technological capabilities of global connectivity, along with older concepts such as cryptography, have enabled individuals and online communities to experiment with digital currencies. They signal the struggle by the general society for autonomy from the centralised financial system. Currently, no state has been involved in the conception of digital currencies (although they do play a role in digitised form of traditional currencies) – they are the product of individual and community activities. It is important to note that there are two types of digital currencies: those used exclusively in virtual economies (e.g. the Linden dollar in Second Life or the various currencies in World of Warcraft) and those used in the real economy. We shall have a critical look at the latter, and will focus specifically on Bitcoin. Bitcoin was first introduced as a piece of open source software that supports the movement of currencies in 2008 by the cryptic Satoshi Nakamoto (likely a pseudonym). The software enables the circulation of alternative currencies by utilising peer-to-peer networks, hence circumventing banks. Instead of distributing the currency through a centralised network controlled by a central bank, Bitcoins are distributed by nodes participating in a peer-to-peer network. All Bitcoin transactions are recorded publicly in a ledger known as the “blockchain”. This feature is, arguably, the main innovation of Bitcoin. It makes it near impossible to spend a particular Bitcoin unit more than once, as all transactions are certified by other users on the network. The work required for the certification of transactions and the maintenance of the ledger is energy-intensive, and is often done by large computer systems participating in a peer network; as an incentive for users to participate as “miners”, they are rewarded with new Bitcoins, or in some cases a fee. The Bitcoin protocol is designed to create new coins at a decreasing rate, and when the number of Bitcoins reaches a designated limit (21 million units) at a future time (estimated around 2140) then the system will stop producing new Bitcoins. After this point, the only financial incentive for miners to continue certifying transactions will be in the form of transaction fees. Bitcoin is often viewed as an “apolitical currency”, devoid of the troubles that burden other currencies, due to it seemingly consisting of just code; a currency free from state intervention and large corporate interests, according to the egalitarian rhetoric that surrounds it. However, it is evident that this is not the case. Besides the fact that there are signs of emerging governance structures in Bitcoin (similar to those of other open source projects), we can also see that its entire logic follows the fundamental rules of other, one might say less revolutionary, currencies. Instead of a regulating central bank, the code is in charge. Lessig (2006) explains that in the digital realm the “code is law”, drawing underlying connections to the political nature of traditional currencies: politics are imbued in each piece of software. In the real world, the law enables banks to mediate credit transactions between the various parties. The law ensures the credibility of contracts, protects property rights and regulates money circulation. In the digital world, the code assumes this role and influences what users can and cannot do. Therefore Bitcoin, as a piece of software, is saturated with ideas drawn from pre-existing political frameworks. As previously mentioned, Bitcoin is deliberately scarce. By limiting it to 21 million units, Nakamoto has created a condition in which the more popular Bitcoin becomes, the higher its price gets, making it more and more difficult to produce. Presumably, the creator’s intention was to create a currency that is rid of debt, in the spirit of various politico-economical critiques against the credit system. After all, Bitcoins do not come about as credit relations between two parties but as “private” information in a network. But the code’s architecture has led to the creation of a Bitcoin “aristocracy” and a tremendously unequal distribution of wealth within the system. Therefore, it can be said that Bitcoin is not a commons-oriented project aiming to satisfy the needs of society, but a currency that reflects a new type of capitalism – a “distributed” one. This new capitalism is one which adapts to the characteristics of the network era, and uses the peer-to-peer infrastructures to achieve capital accumulation. 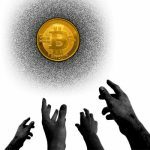 Bitcoin may appear to exist outside the financial system, but by promoting scarcity and competition, it actually aggravates the over-accumulation of capital and exacerbates the social inequalities that its supporters hope it will combat. Distributed capitalism’s premise is the idea that everybody can trade and exchange; or put more bluntly, that “everyone can become an independent capitalist” (Kostakis and Bauwens, 2014). Some libertarians advocate the elimination of the state in favour of individual sovereignty, private property, and free/open markets. In theory, you have individuals that are equally capable to participate in a project, but in practice what one gets is concentrated capital and centralized governance. We dare say that the anarcho-capitalist design of Bitcoin, based on the Austrian school of economics, exacerbates the characteristics of the neoliberal era; the promise given by the idealistic concept of distributed capitalism doesn’t pan out in reality. So is Bitcoin a scourge? A misguided information technology tool, here to create more problems than it solves? Not necessarily. Bitcoin should be viewed as a new technology, not just a currency. One might say that rather than providing answers and solutions to the current views of the financial crisis, perhaps Bitcoin provides some useful and timely questions about the principles and bases of the dominant political economy. Furthermore, since it is an open source piece of software, it can be forked (meaning the original code can be copied and developed separately). It has, thus, paved the way for a new type of currencies that utilize new technological infrastructures and whose dynamics should not be ignored. The blockchain enables a decentralized network to achieve consensus without requiring any trust between parties and the potential of its innovations is very promising. The possibility to record every interaction on an incorruptible public ledger, and the ability to encode a particular set of rules linking these interactions to specific transactions, makes it possible to design new sophisticated incentive systems. Going a step further, as new projects like Ethereum illustrate, this technology is applicable for various applications. The decentralized power of the blockchain, if harnessed properly, may provide users and communities with the opportunity to create tools for collaboration in large scale without the mediation by either the government or private for-profit entities. Tools for the creation of a true sharing economy, where all the power lies with the users, instead of large corporations whose goals and methods are questionable to say the least, as illustrated by the numerous controversies surrounding Uber. So the question here is, who will utilise this technology, and for what means? Carlota Perez, ‘The Double Bubble at the Turn of the Century: Technological Roots and Structural Implications’, Cambridge Journal of Economics 33.4 (2009): 779-805. Lawrence Lessig, Code. Version 2.0, New York: Basic Books, 2006. Thomas H. Greco, The End of Money and the Future of Civilization, Vermont: Chelsea Green, 2009. Vasilis Kostakis and Michel Bauwens, Network Society and Future Scenarios for a Collaborative Economy, Basingstoke, UK: Palgrave Macmillan, 2014. 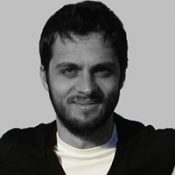 Vasilis Kostakis is a Senior Research Fellow at the Ragnar Nurkse School of Innovation and Governance, Tallinn University of Technology and Founder of research hub P2P Lab. Chris Giotitsas is a research fellow at the P2P Lab. Currently, he is pursuing a PhD at the school of management, University of Leicester, UK, investigating open source technologies.